The Johnstown Tomahawks’ 4-2 win over the Jamestown Rebels on Saturday meant a lot more than just two points in the standings. It was the Tomahawks’ seventh annual Faceoff Against Cancer night, and this season, it took on a personal meaning for the squad. 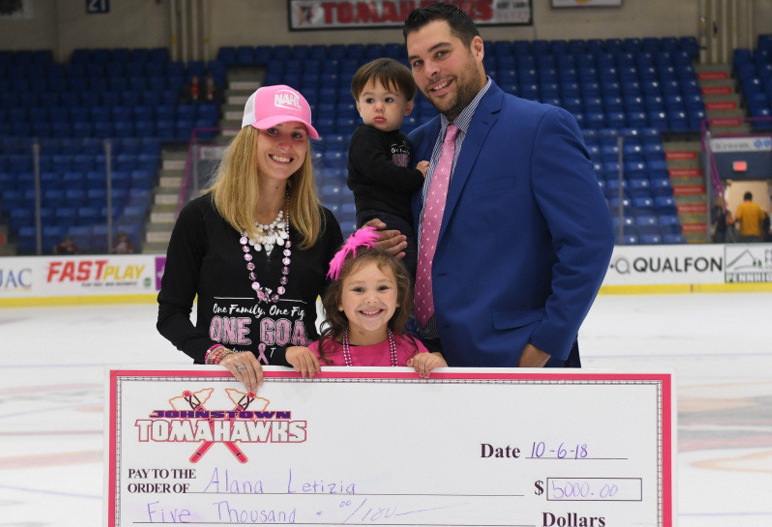 The team raised over $10,000 of the ice to benefit Alana Letizia, the wife of head coach Mike Letizia, who has been diagnosed with breast cancer; the family of Tomahawks forward Joey Baez, who lost his father to colon cancer on Sept. 30; Ian Rosenbaum, a six-year-old member of the Johnstown Little Warriors that is fighting leukemia; the Joyce Murtha Breast Care Center and the Tomahawks Foundation. The Tomahawks got three goals in the second period from Mitchell Hale, Samuel Solensky and Andy Nedeljkovic to pull away and earn a weekend split with Jamestown. At 7-3, Johnstown is in first place in the NAHL East Division. The Tomahawks will make their first trip to Piney Orchard Ice Arena in Hanover, Maryland next weekend to face the expansion Maryland Black Bears. They visit Wilkes-Barre/Scranton the following weekend before returning home to face the Northeast Generals as 1st Summit Arena on Oct. 27 and 28.